Customers are increasingly savvier and more discerning about which businesses they support. Before making a decision, they’ll do a quick search to browse your website and social media. Customers aren’t interested in businesses that publish dry, corporate-style social media posts. But remember: you don’t have to do everything. Play with new ways to connect with your audience, and give yourself permission to learn as you go. One day, you could post a series of Instagram Stories to give customers a behind-the-scenes tour of your office. The next, you could host a quick Q&A session via Facebook Live video streaming. Over time, you’ll get a better idea of your followers’ preferences. When building an ad campaign, know who you’re trying to reach and what goal you want to achieve so you don’t waste any of your budget on unhelpful advertising. Avoid overly salesy ads, and opt for content that educates or entertains (or does both at the same time). Social media is a crucial part of your business marketing, but it doesn’t have to be stressful to manage. Take the first step, create a profile, and start engaging with your customers. How has social media proven to be a wise business move for you? Tell us in the comments below! 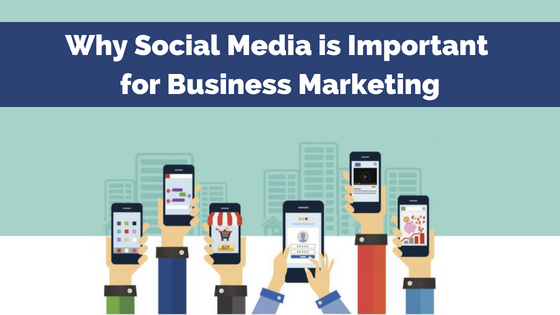 The post Why Social Media Is Important for Business Marketing appeared first on B Squared Media – Social Media Management. Hi, Thank you for sharing such kind of information. it will help me to increase visibility online Labradorite market. Thanks for sharing, so glad this has been helpful to your work! Social media is simply another show of proof for people searching you out as well that you know what you’re talking about! Even I’ve caught myself looking up others whom I was interested in either training, or working with, on Facebook to see that their profile is setup nicely. Great points in this post, and great job! Absolutely, social media is all about brand identity! Thanks for the feedback.